Do all babies stand on their tip-toes? It seems an odd thing to do before more basic skills like walking, but Sophie likes to stand on tip-toe, to reach as far as she possibly can. She also likes to climb stairs, and furniture, and adults, and anything else available to be climbed. I’m a little frightened at how eager she is to grow up. In Sophie’s view, the main thing that grown-ups do is hold spoons. So Sophie is in a big hurry to wield her own spoon. It’s adorable and messy. Dinner, originally uploaded by Ben Love. She is anxious to feed herself, but she also understands that what grown-ups do is feed others. So Sophie spends a lot of time waving her spoon near the yogurt container, then near our faces – and she squeals if we actually pretend to eat from the empty spoon she is so generously offering. She doesn’t limit herself to food, either. She generously fed leaves to her six-month-old friend Landon yesterday. She likes to take a brush and try to brush our hair. If Ben is around, she’ll take turns, brushing his hair and then mine. Then this morning, she seized the toothbrush and tried to brush my teeth – before deciding that maybe the toothbrush too could be used to comb my hair. 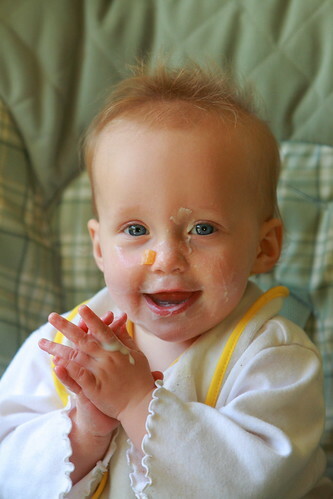 I don’t know if all babies go through this generous & messy phase, but it’s incredibly endearing.